In a fitting climax to the Quiksilver and Coca-Cola Amatil sponsored Bali Big Eco Weekend, Bali legend Made Switra barreled his way to victory and celebrated his win at Single Fin as the sun set on a day of epic waves. The event brought tourists, local surf community members and legendary local and international surfers together to surf Uluwatu in order to highlight its beauty and the need to continue to improve the environmental welfare of Bali. 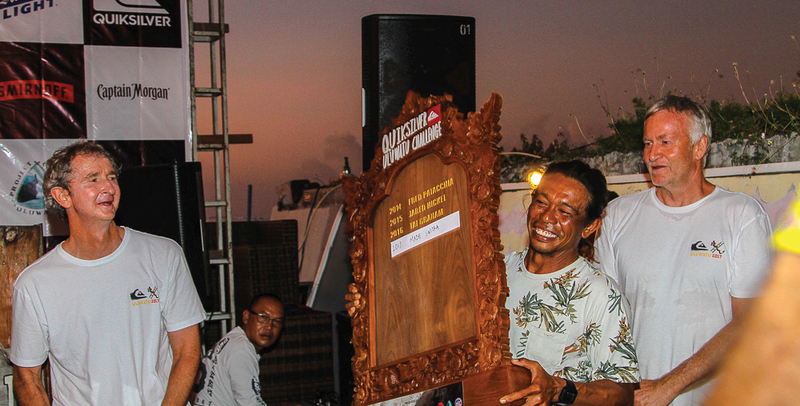 For his win, Switra had the honor of adding his name to the perpetual Quiksilver Uluwatu Challenge trophy and having it presented to him at Single Fin by none other than 4-time World Champion Mark Richards and Simon Anderson, the inventor of the thruster surfboard. Switra shared, “I didn’t think about winning the contest today, I just wanted to enjoy good waves with good friends and have some fun. I was winning already when I paddled out but it’s great to be the chosen winner of this event and I want to say thanks to God, thanks to the Ulu boys and to all the legends that joined in as well. For just Rp2 million ($150 USD) entry fee, the lucky 40+ surfers paddled out in perfect 4-5ft Uluwatu to compete with Quiksilver legends including Mark Richards, Matt Hoy, Tom Carroll, and Simon Anderson. Joining the international legends were Bali legends that included Ketut Menda, Made Switra, Made Lana, Tipi Jabrik, Dede Suryana and Rizal Tanjung as well first time international competitors Dylan Longbottom, Ozzie Wright and professional snowboarder Matt Crepel for a total of 54 participants. This year’s Quiksilver Uluwatu Challenge was run in the Eddie Aikau 6-person heat format where each surfer competes in two 30-minute heats and their two highest scores from their four best waves were then scored and totaled. Switra was the surfer with the highest two-wave score total of 17.5 (out of a possible 20 points) with a 9.0 (out of a possible 10 points) in Heat 1, and then an 8.5 in Heat 2, both being deep Racetrack barrels. The 5th annual Quiksilver Uluwatu Challenge this year was a fundraiser by Quiksilver and Coca-Cola Amatil Indonesia for the Uluwatu based NGO, Project Clean Uluwatu (PCU), to raise money that will go towards new infrastructure programs at Uluwatu that will keep the world-class wave clean and pristine for generations to come. Bringing world-renowned surfing legends to Bali helps to draw attention to the challenges it faces with accelerating tourism growth.